The only decision you face is whether or not to go with a garage. Here are some factors to consider when choosing your best option. Cars without shelter are exposed to the elements 24/7, so they get dirty much more quickly than cars in garages. Outdoors, cars are also vulnerable to inclement weather such as rain, snow and windstorms. It's not much fun scraping ice off a windshield on a cold winter morning. 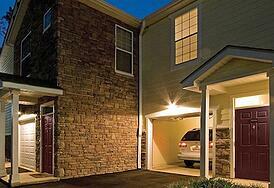 Attached garages have a bit of an edge over detached garages when it comes to personal protection. You can stay dry and warm as you go back and forth between car and apartment. Have you ever opened the door to your car only to feel like you were climbing into a blast furnace? Cars that sit inside a garage don't go through extreme temperature swings, but even if you don't have a garage, Springs apartments have private entries to every home for your convenience. Having a garage is a great way to increase your storage space. Even with a car sitting inside, a garage can accommodate items that may be awkward to keep inside your apartment home. You never have to worry about finding a parking spot. Our communities have ample parking, but sometimes you might not find a space right in front of your home. It's nice to know that if you've been out shopping, you won't have go far to carry your purchases. If you have two vehicles, most of our attached garages have a short driveway that you can also use for parking. So you rely on bicycles or public transportation to travel around town? If you like DIY projects or have any type of collections, a garage allows you the room to enjoy your hobbies without being confined to a small area inside your apartment home. Attached garages generally cost a bit more than detached garages. If you’re looking to economize, you may want to forego the added convenience of an attached garage. Is it true that clean cars run better? Regardless of your parking choice, our on-site car wash areas are available to all residents. Our friendly on-site management team will be happy to answer questions about these and other upscale amenities at our Springs Apartments communities!